I hate to say it, but I have just not been in the mood to cook lately. I’d call these the lazy man’s cookie bars. They are super fast, easy, and you only need a few ingredients- all of which I had in my pantry (except topping, so i left it out). They call these toffee bars- and maybe they are a lot more toffee-y w. the topping. 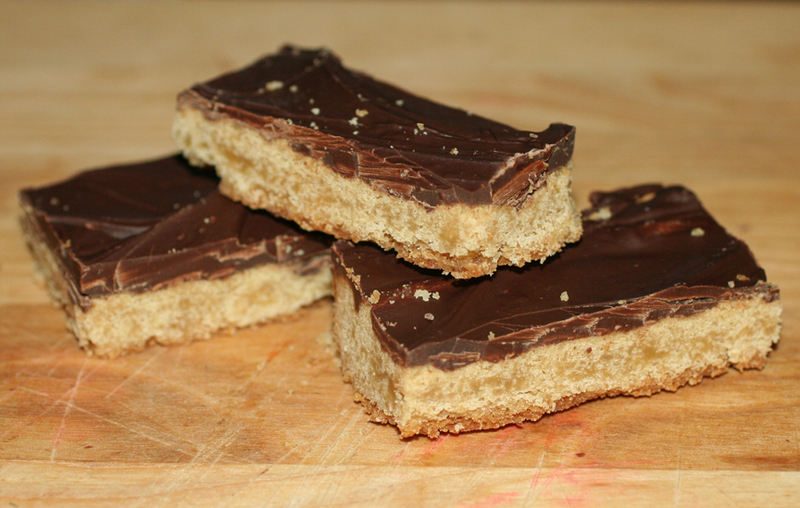 I think they are sorta more like shortbread w. a slab of chocolate on top. I love these– and always eat way too many. Preheat oven to 350. Grease 9×13 pan. Cream butter and sugar. Add yolk and beat well. Sift flour into bowl (first time i ever sifted- don’t know what difference that makes). Mix. Add vanilla. Spread into prepped pan. Bake 25 minutes (i took mine out after 20). Sprinkle on chocolate chips. Put back in oven for 3-4 minutes. Take out and spread chocolate w. rubber spatula. Add any toppings. Wait until cool to cut. I put them in fridge to harden the chocolate- and I think these taste better that way.